The wheels are divided into two types: General Wheel and Premium Wheel. 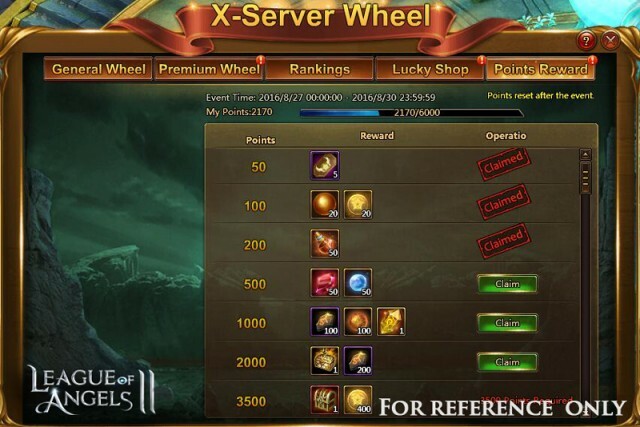 -General Wheel: Spend 100 regular Diamonds or 1 X-Server Lotto Ticket for 1 spin of the wheel. -Premium Wheel: Available for VIP4 and above. Spend 100 Topaz for 1 spin of the wheel. The rewards for Premium Wheel are much greater than those of General Wheel! -Silver Token: For each spin of General or Premium Wheel, players will get 1 Silver Token. -Gold Token: Spin the Premium Wheel for a chance to get Gold Tokens. Note: Gold and Silver Tokens will be emptied when this event ends. Each spin earns 10 points. When players reach certain points, they can claim corresponding rewards! Players who get more than 300 points are qualified to show up on the Rankings, which has a cap of 50 players. Since players from a same server group will all compete in their rankings, the competition will be more intense than Wheel of Fortune! Players in the Rankings can claim the corresponding ranking rewards. What’s more, players who have points more than 3000 points will earn Super Rewards including very rare items! As one of the rewards in Super Rewards, Magic Voucher enables player to buy Divine Steed with a lower price in Events! Plus, other great Mounts, Suits, and Mythic items can be gained with Magic Vouchers as well! 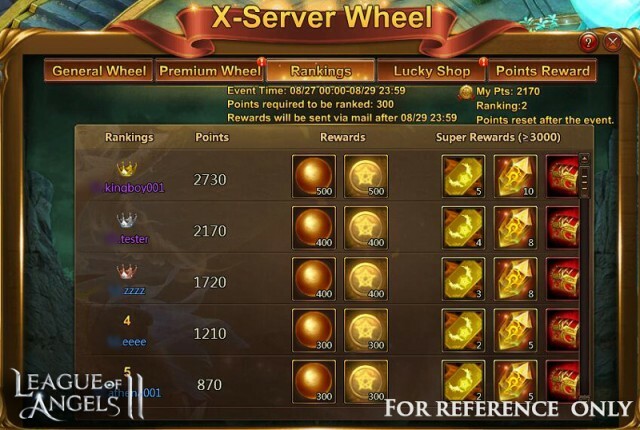 Remember to spin the X-Server Wheel from August 27th to August 29th! The ultimate prize, Divine Steed, is waiting for you to take home!